1 Owner No Accidents Rust Free AZ Car, Bluetooth, Aux Input, Newer Tires, Pwr Seat, 103k mi 35 MPG! Just in! 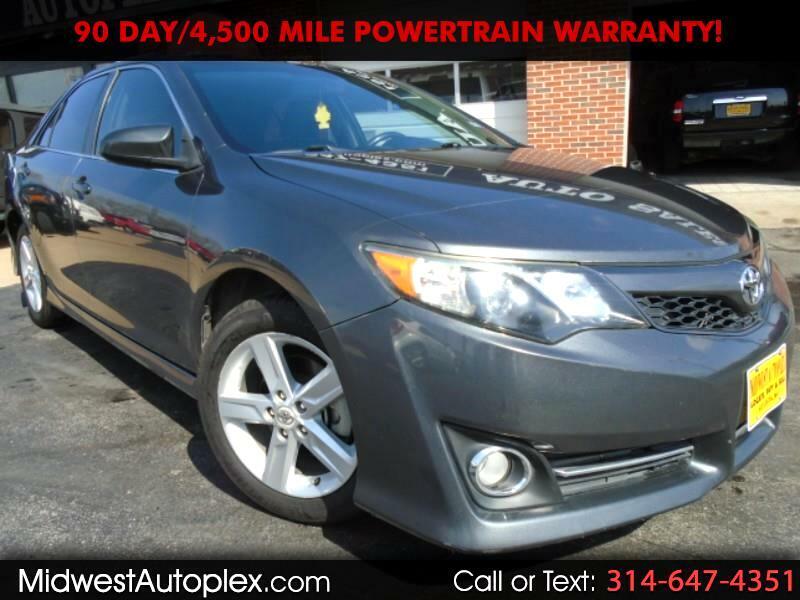 Check out this 2012 Camry SE! It’s one of the most popular models out there, it’s proven to be safe, reliable and an excellent investment--a proven value you’ll love. Make it yours before it’s gone! Impressive Perfect 1 Owner No Accident Rust Free AZ car! Priced WAY BELOW Carfax Retail Value $11,710!! TIMING CHAIN, Remote Start keyfob MIA, 90% Tire Treads, Bluetooth Aux Input, XM, Leather trimmed Power Seat, Power everything, Gas Sipping 2.5L 6-Speed Automatic with Select-Shift 35 MPG HWY!! absolutely STUNNING!! Best Price in Town. FREE Warranty, Safety and Emissions Inspected, AutoCheck or Carfax Clean! Just e-mail us & we'll fwd you a FREE copy. EASY No Haggle Price! A+ rated by Better Business Bureau. Our Clients are extremely important to us and it shows, Financing Available (W.A.C.) at 3.75%. Try $192 per month with $500 DOWN. 2012 KBB.com 10 Most Comfortable Cars Under $30,000 * 2012 KBB.com 10 Best Sedans Under $25,000 * 2012 KBB.com Best Resale Value Awards. -We Finance Good Bad or No Credit! Please have a good cosigner or 40% down if you've had a bad auto loan/repo since 2016!! BUY HERE PAY HERE loan programs for local folks. -Rates as low as 2.74%. -90 Day/4,500 Mile Powertrain Warranty or Factory Warranty. Extended Warranties available. -Trade Values Established from National Auto Dealer Association at www.nadaguides.com. -Vehicles come State Inspected/Emissions with 30 day temp tags. -Non commissioned sales staff, so you will never be pressured into a decision. -Little to No Money Down in Many Instances. -1Price used vehicles, no haggle, no pressure. -Optional 3-day return policy for additional $250 plus mileage at 54.5 cents per mile. -Almost every vehicle over $10k comes with a Free CarFax Report and a CarFax BuyBack Guarantee. -We have successfully shipped all over North America and Canada. Contact us for a quote. -MENTION THIS WEB AD SITE for a FREE GAS CARD with your purchase! !